Will 'The Spider' make the same mistakes on Dec. 28? 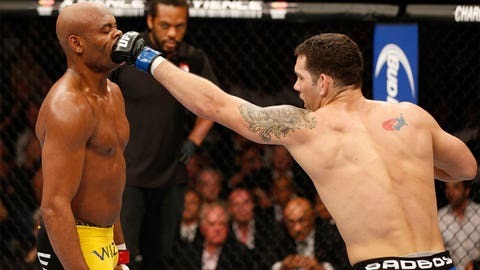 Anderson Silva believes he lost his title in July because of things that happened long before he and Chris Weidman stepped into the MGM Grand in Las Vegas. "It was a collection of mistakes leading up to that fight that followed me into the Octagon," Silva told FOX Sports through a translator. The former UFC middleweight champion, and greatest pound-for-pound fighter of all time, wouldn’t explain what those missteps were. And why would he? Silva has carried an air of mystery since coming into the UFC seven years ago. "That’s a secret," Silva said of the mistakes. "If I told you, I’d have to find you and I’d have to kill you." It was a collection of mistakes leading up to that fight that followed me into the Octagon. It’s impossible to completely get into Silva’s head. You might think he’s giving you a piece here and a nugget there. But really, there’s a reason behind everything he says, the same way there’s a method behind every move he makes in the cage. You have to take everything Silva says with a grain of salt. In an interview with FOX Sports on Friday, the Brazilian said his fight with Weidman on Dec. 28 at UFC 168 didn’t matter to his legacy. He doesn’t care about getting revenge on Weidman. He would have preferred to fight Roy Jones Jr.
Silva played with fire at UFC 162, and got burned. Is that really true? Or more games from the most enigmatic fighter in the UFC? It’s impossible to know. Silva likes to play cat and mouse with reporters the same way he does in the Octagon. He waits for an obvious, trite question and then counters with a dismissive remark or one-word answer. "Basically, sometimes a reporter will ask a question and I feel the answers only matter when the questions are relevant," Silva said. In other words, those cliche questions are unworthy of Silva, so he clowns them as if they were Demian Maia. Past waters don’t move anything. They only create mosquitoes. Silva admitted that part of his style of dropping his hands and daring his opponent to hit him is to increase the level of difficulty for himself. He’s obviously become uninterested with just winning outright. Wouldn’t you be bored if you won everything you competed in rather easily over the course of seven years? It’s hard to say how the loss in July affected him. He won’t talk about it or the video showing him get emotional backstage with his team. Silva isn’t going to let anyone in. The only Anderson Silva we know is the one we see in the Octagon. Which begs the question: Will that be the same Silva we see next weekend?